John Singleton Copley (1738-1815), Painter. Artist associated with 21 portraits, Sitter in 5 portraits. Jeffrey Amherst, 1st Baron Amherst (1717-1797), Field Marshal. Sitter in 7 portraits. Robert Bertie, 4th Duke of Ancaster and Kesteven (1756-1779), Politician; Lord Great Chamberlain. Sitter in 2 portraits. Henry Bathurst, 2nd Earl Bathurst (1714-1794), Lord Chancellor. Sitter in 7 portraits. William Ponsonby, 2nd Earl of Bessborough (1704-1793), Politician and public servant. Sitter in 3 portraits. Richard Brocklesby (1722-1797), Physician. Sitter in 4 portraits. John Stuart, 1st Marquess of Bute (1744-1814), Diplomat and collector. Sitter in 13 portraits. Charles Pratt, 1st Earl Camden (1714-1794), Lord Chancellor. Sitter associated with 30 portraits. William Pitt, 1st Earl of Chatham (1708-1778), Prime Minister. Sitter associated with 33 portraits, Artist associated with 1 portrait. John Pitt, 2nd Earl of Chatham (1756-1835), General. Sitter in 7 portraits. William Courtenay, 2nd Viscount Courtenay (1742-1788), Son of William Courtenay 7th de jure Earl of Devon. Sitter in 2 portraits. George William Coventry, 6th Earl of Coventry (1722-1809), Politician; MP for Bridport and Worcestershire. Sitter associated with 3 portraits. William Legge, 2nd Earl of Dartmouth (1731-1801), Lord Privy Seal. Sitter in 3 portraits. William Cavendish, 5th Duke of Devonshire (1748-1811), Lord High Treasurer of Ireland. Sitter in 8 portraits. John Ward, 2nd Viscount Dudley and Ward (1725-1788), Politician; MP for Marlborough and Worcestershire. Sitter in 2 portraits. Thomas Howard, 3rd Earl of Effingham (1746-1791), Nobleman, army officer and Governor of Jamaica. Sitter in 5 portraits. Archibald Montgomerie, 11th Earl of Eglinton (1726-1796), General and politician. Sitter in 4 portraits. Henry Belasyse, 2nd Earl of Fauconberg (1743-1802), Politician; Lord of the Bedchamber. Sitter in 3 portraits. Robert Shirley, 6th Earl Ferrers (1723-1787), Nobleman. Sitter in 2 portraits. William Wentworth Fitzwilliam, 2nd Earl Fitzwilliam (1748-1833), Lord-Lieutenant of Ireland. Sitter in 13 portraits. Henry Frederick, Duke of Cumberland and Strathearn (1745-1790), Brother of George III. Sitter associated with 6 portraits. Alexander Gordon, 4th Duke of Gordon (1743-1827), Representative peer. Sitter in 2 portraits. George Simon Harcourt, 2nd Earl Harcourt (1736-1809), Politician; MP for St Albans, fellow of the Society of Antiquaries and Doctor of Civil Law. Sitter in 8 portraits. John Hinchliffe (1731-1794), Bishop of Peterborough. Sitter in 5 portraits. George Bussy Villiers, 4th Earl of Jersey (1735-1805), Courtier. Sitter in 6 portraits. William Robert Fitzgerald, 2nd Duke of Leinster (1749-1804), Irish Politician; MP for Dublin and Kildare. Sitter associated with 5 portraits. William Henry Lyttelton, 1st Baron Lyttelton (1724-1808), Barrister and politician. Sitter in 2 portraits. George Montagu, 4th Duke of Manchester (1737-1788), Politician and diplomat. Sitter in 4 portraits. William Murray, 1st Earl of Mansfield (1705-1793), Judge. Sitter in 16 portraits. William Markham (1719-1807), Archbishop of York; Headmaster of Westminster School. Sitter in 11 portraits. George Brudenell Montagu, Duke of Montagu (1712-1790), Courtier. Sitter in 3 portraits. George Edgcumbe, 1st Earl of Mount Edgcumbe (1720-1795), Naval Lieutenant and politician. Sitter in 8 portraits. George Onslow, 1st Earl of Onslow (1731-1814), Politician; MP for Surrey. Sitter in 3 portraits. James Charles Pitt (1761-1781), Naval captain; third son of 1st Earl of Chatham. Sitter in 2 portraits. William Henry Cavendish Bentinck, 3rd Duke of Portland (1738-1809), Prime Minister. Sitter associated with 32 portraits. Jacob Pleydell-Bouverie, 2nd Earl of Radnor (1750-1828), Politician; MP for Salisbury. Sitter in 6 portraits. Alexander Wedderburn, 1st Earl of Rosslyn (Lord Loughborough) (1733-1805), Lord Chancellor. Sitter associated with 33 portraits. George Sackville Germain, 1st Viscount Sackville (1716-1785), Soldier and statesman. Sitter associated with 18 portraits. Nathaniel Curzon, 1st Baron Scarsdale (1726-1804), Politician and art collector. Sitter in 2 portraits. Jonathan Shipley (1714-1788), Bishop of St Asaph. Sitter in 7 portraits. Sir John Skynner (1724?-1805), Chief Baron of the Exchequer. Sitter associated with 2 portraits. John Spencer, 1st Earl Spencer (1734-1783), Politician; MP for Warwick. Sitter in 3 portraits. Granville Leveson-Gower, 1st Marquess of Stafford (1721-1803), Politician; Lord Privy Seal. Sitter in 6 portraits. Charles Stanhope, 3rd Earl Stanhope (1753-1816), Scientist and politician; MP for Wycombe. Sitter associated with 46 portraits. Richard Grenville-Temple, 2nd Earl Temple (1711-1779), Statesman. Sitter in 16 portraits. John Waldegrave, 3rd Earl Waldegrave (1718-1784), Politician and Lieutenant-Colonel. Sitter in 2 portraits. John Fane, 10th Earl of Westmorland (1759-1841), Politician; Lord Privy Seal. Sitter in 19 portraits. 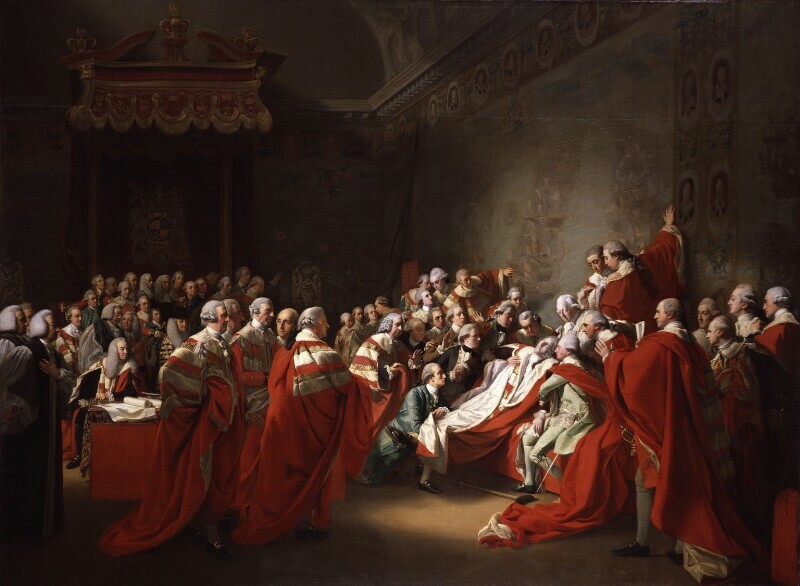 The painting represents the dramatic collapse of William Pitt, 1st Earl of Chatham, in the House of Lords on 7 April 1778. Chatham had just delivered a speech urging for a peace settlement with the revolutionary Americans. In order to preserve the empire he had done so much to build up, Chatham called for any form of settlement short of total independence. On rising, for a second time, to rebut the Duke of Richmond's motion that the American colonies be given independence, Chatham suffered a heart attack. The fallen Chatham is surrounded by his three sons and his son-in-law (Lord Mahon) and supported by the Dukes of Cumberland and Portland. Chatham never recovered and died a month later at his country estate. The American Copley, following the example of his compatriot Benjamin West, employed the heightened emotions and grand gestures of traditional history painting to a contemporary event. The portraiture is direct, being based on individual studies, but considerable licence has been taken in the theatrical composition and the lighting. The painting excited much controversy when exhibited in 1781. Admiral Augustus Keppel, First Lord of the Admiralty during the final years of the American War of Independence is tried and acquitted at court martial of misconduct at the Battle of Ushant the previous year. His case becomes a cause célèbre. Botanist Joseph Banks tells a committee of the House of Commons that the east coast of Australia is suitable for the transportation of convicted felons. Penitentiary Act authorises state prisons. Swiss artist Henry Fuseli settles in London after nine years in Rome. Painter and President of the Royal Academy Joshua Reynolds' celebrated Discourses on art are published as a book. World's first iron bridge is assembled across the Severn at Coalbrookdale.Inventor Samuel Crompton introduces the Spinning Mule. John Newton and William Cowper's Olney Hymns is published, containing the first printed version of Amazing Grace. American War of Independence: Spain, in alliance with France and the US, declares war on Britain. Great Siege of Gibraltar begins, in which French and Spanish forces try to wrest power from the established British Garrison, under the leadership of General George Augustus Eliot. Captain James Cook is killed in a skirmish with natives on the Sandwich Islands on his third and final voyage. The display caption in Tate Britain for one of the two preparatory oil paintings of The Death of Chatham explains, as the present article does, that the event took place on april 7th 1778, whereas the title of the picture is July 7th 1778 (in Tate Britain). Could you tell me the right date please ? Besides, an engraving in the British museum by William Angus shows the painting exhibited in Spring Gardens in 1781 ; Copley was RA in 1781 ; why was it not exhibited in the RA ?